It's finally starting to feel like grilling weather, folks! That means we'll find any reason to take the kitchen outdoors. We had a little Cinco de Mayo cookout with some friends, and we've got some great Mexican-inspired recipes that are great for crowds to share with you! You've got a week's notice til May 5th, so you've got no excuses not to make these easy-peasy recipes and have some pals over. First up: the beergartita, because no gathering is complete without a signature drink. 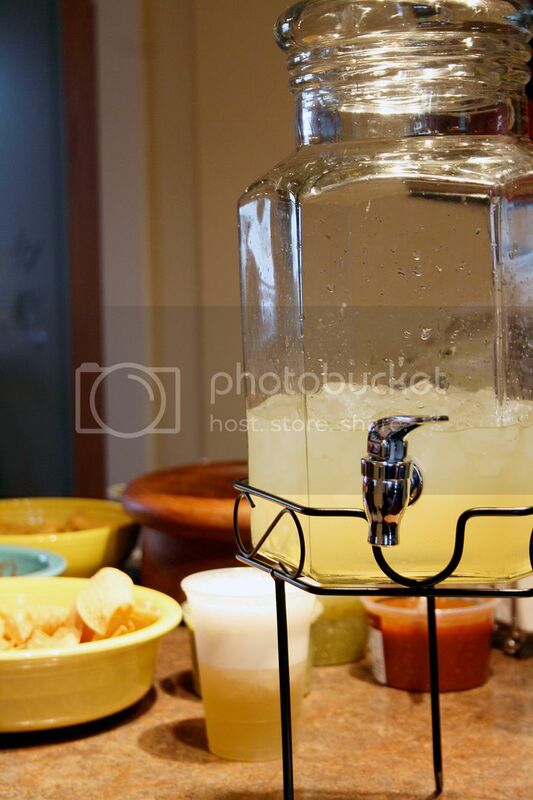 Dump your limeade into a pitcher. Now use the empty canister to measure your tequila, beer and water. Combine all ingredients and stir. Add as much ice as you'd like. Pour into salt rimmed glass and enjoy! Next up: the meat seasoning created by Molly's husband. This spice rub combination makes for an aromatic and flavor-packed mix with a kick, and it's always a crowd favorite. 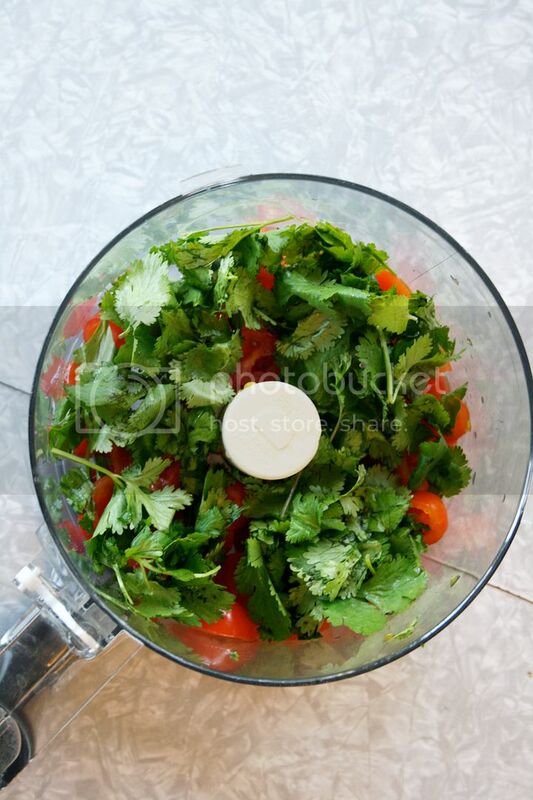 It's also great because it makes a large batch, so you can save some in an airtight bag or container for later! It goes wonderfully on all types of meat, from beef, to chicken, to pork, to shrimp. Combine all ingredients and rub a thin layer on the meat. Grill as usual. To top off tacos, a cilantro lime sauce provides a bright and fresh finish. You can also use it as a dip for tortilla chips. Blend all ingredients together in a food processor and then drizzle over all your tacos, chips, rice, and anything and everything else. You won't regret it. 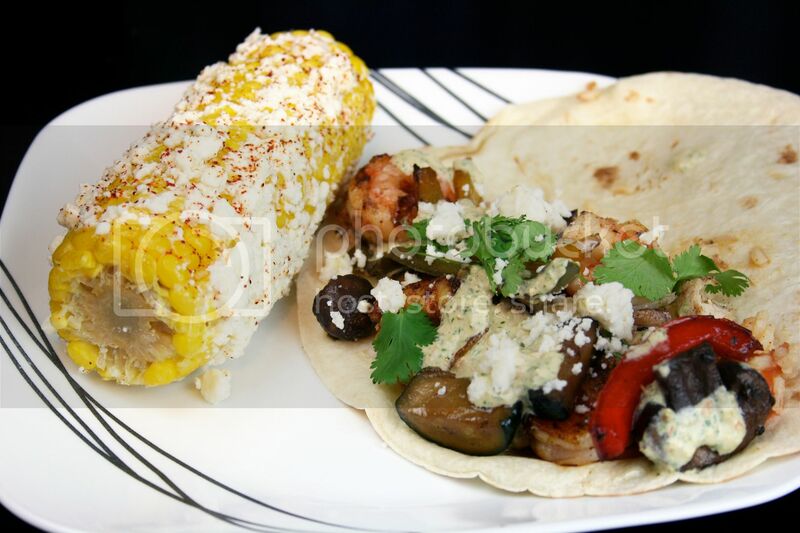 Mexican Street Corn, brought by some of our guests, was the perfect traditional accompaniment! 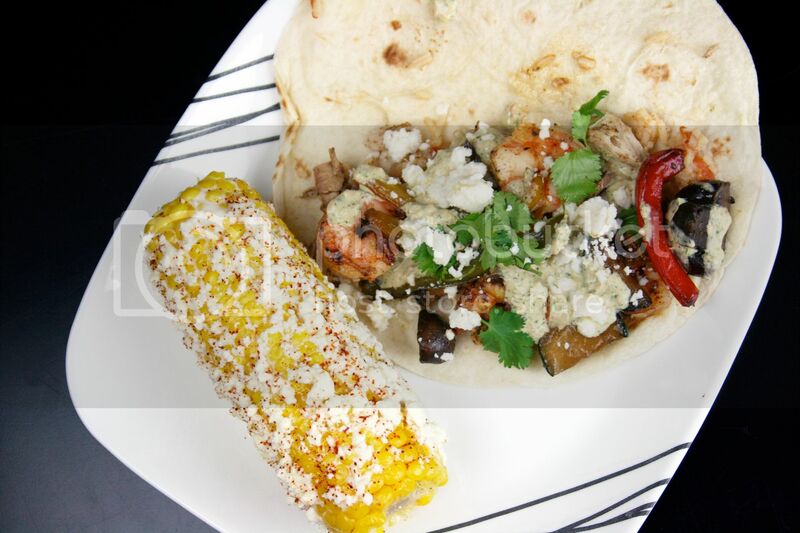 Just grill corn on the cob, slather with mayonnaise, roll in some cotija cheese, sprinkle with cayenne and drizzle with freshly squeezed lime juice. A little messy, but so tasty it's more than worth it! What are your favorite Mexican-inspired dishes? We always need new ones to add to our repertoire. 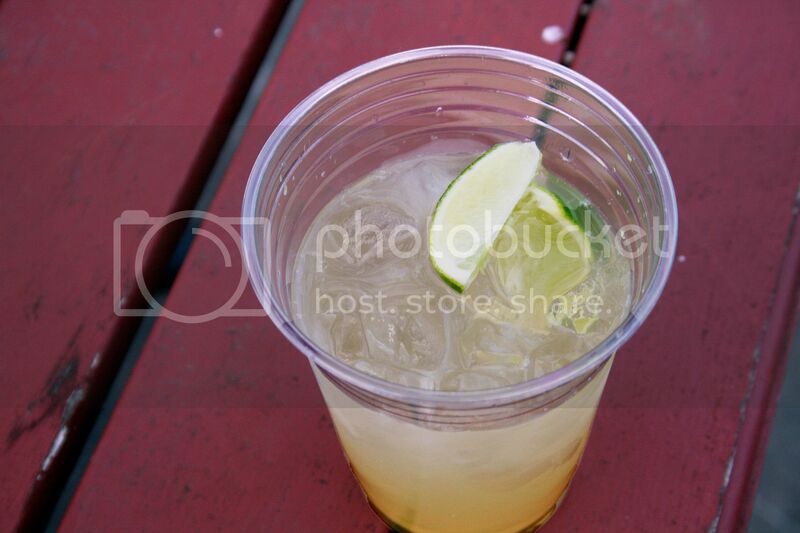 In the meantime, hope you enjoy our beergaritas, meat seasoning, cilantro lime sauce, and street corn for your party! Cheers! So, we have some big news and big changes coming to Mod Circus. As you probably read in the title, my husband and I are moving to Kansas City, Missouri! He accepted a position to teach and work in the Bloch School of Management at UMKC, and it's a seriously awesome opportunity we're thrilled about. Probably the most common question I get asked after we tell people is if Jodi and I are going to continue with the blog. Fear not my friends, the answer is a resounding "yes!" Things will obviously not be the same since we'll be living over five hours away from each other, and not a block away, but we're putting plans in place to make it work. 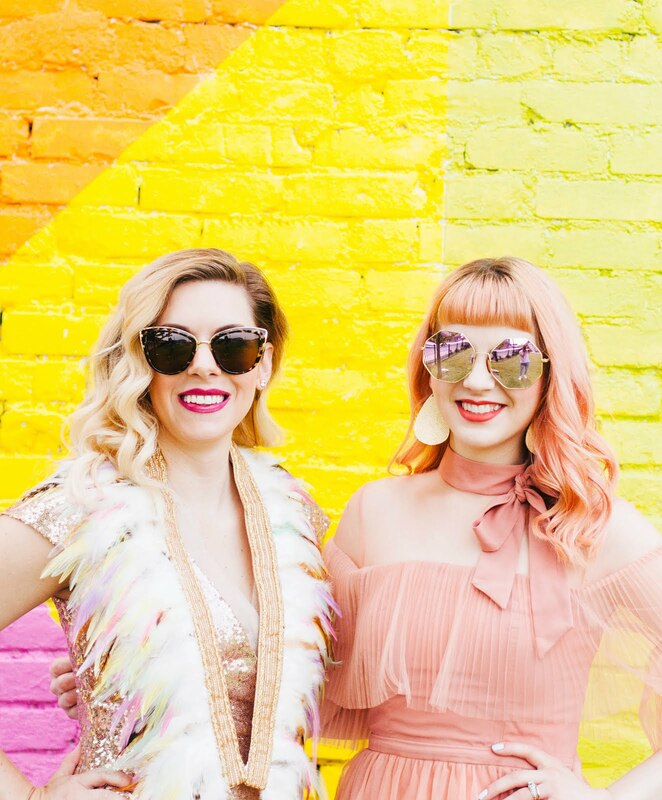 While it's no doubt sad for us as not only blog partners, but as good friends, we're also super excited about all the new restaurants, shops, art and culture Kansas City has to offer that I'll be able to feature on the blog. Being in two different locations, we'll be able to cover life in both Missouri and Illinois, and hopefully, that will make for a richer, more encompassing experience for you lovely readers. And we may even meet up halfway to cover more ground! My husband and I snapped these pics last weekend while visiting Kansas City looking for a place to live. 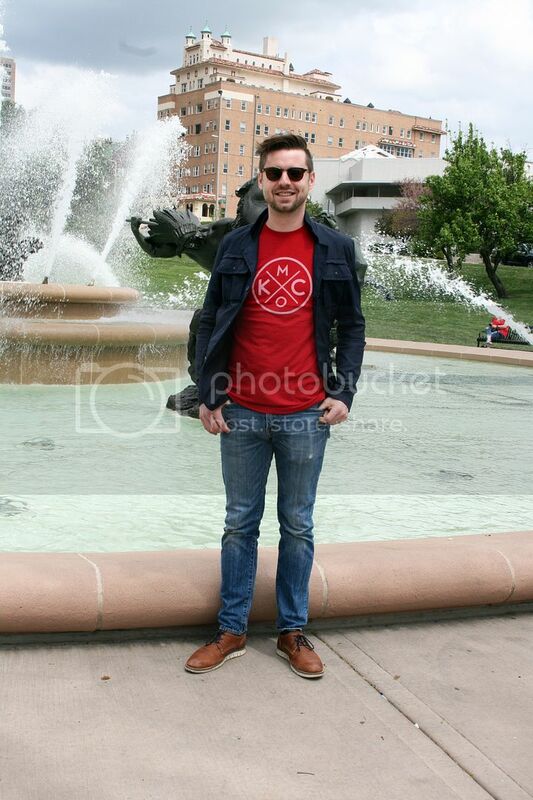 For these photos, in the "City of Fountains" (OK, and BBQ. And jazz. ), we thought it would only make sense to go to the most well-known fountain in the city, The JC Nichols Memorial Fountain. 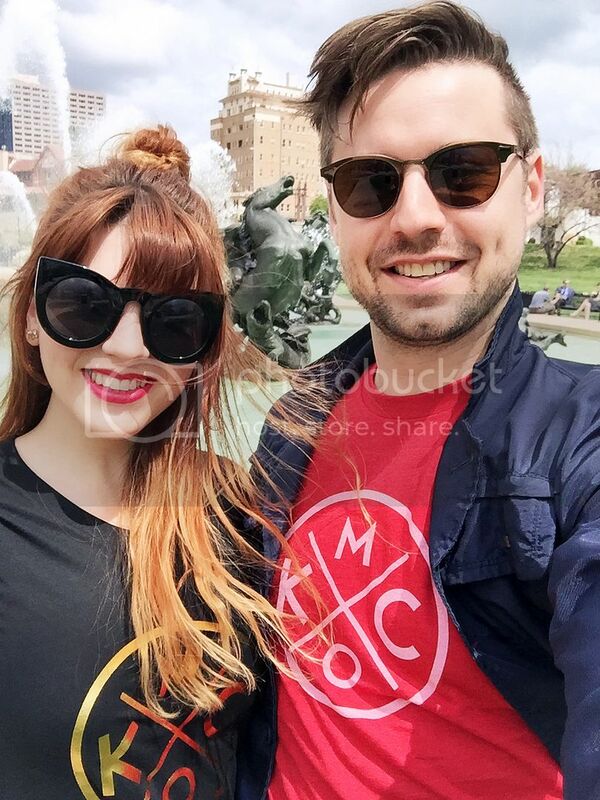 We also got decked out in our new KCMO tees we ordered from The Bunker. I know, what tourists we are, but how cool are they? I styled mine with flared crops and lace up shoes for a polished but casual Sunday afternoon look. We move in about a month, so not long after that, you can expect to see local Kansas City spots on the blog as well as Central Illinois. I was born and raised about an hour from Kansas City, so I'm excited to get reacquainted with place I referred to as "The City" while growing up. And to drag my Illinoisan husband back to the good ol' MO with me too. OK, usually, Our Beautiful Husbands (or OBH for short) stay behind the camera, but I thought he deserved a shot in this post. He was hesitant, but he's a natural, huh? 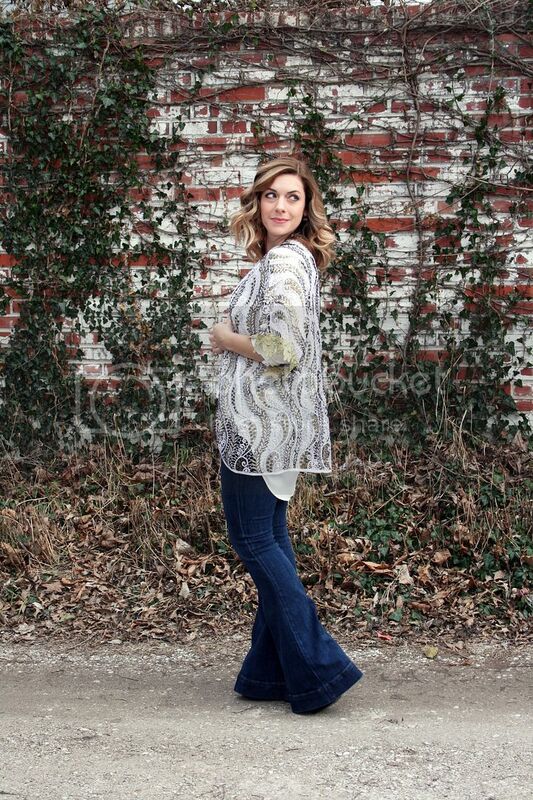 If you've been following along for a while now, you know that we love a good kimono! They come in all sorts of shapes and sizes, long, short, fringey, floral, metallic - you name it, we've probably got a kimono in that shape and style. They are great for throwing on over a dress or jeans and changing up your outfit. 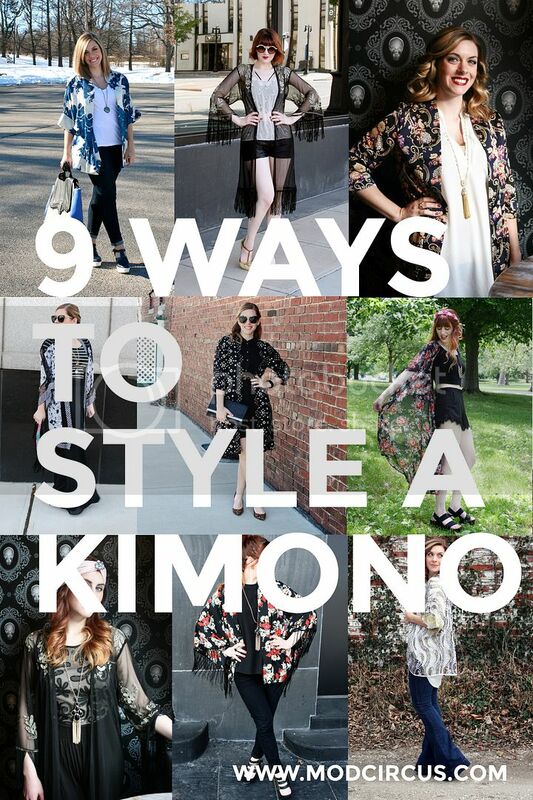 Below, check out nine different ways we have styled a kimono in the past year! 1. Spice up a white tee. Sometimes you just can't beat a plain white tee. It's super comfy and goes with just about anything. For those days when you want to spice up your plain white tee though, throw on a kimono over the top and you're set! See how Jodi takes simple jeans and a white tee from basic to stylish in her Winter to Spring Kimono post. 2. Sheer layers on sheer layers. Give your kimono a sultry vintage vibe by putting it over sheer layers and adding '20s inspired details like round sunnies or a dark red lip. You'll be all ready to hit the Cabaret! 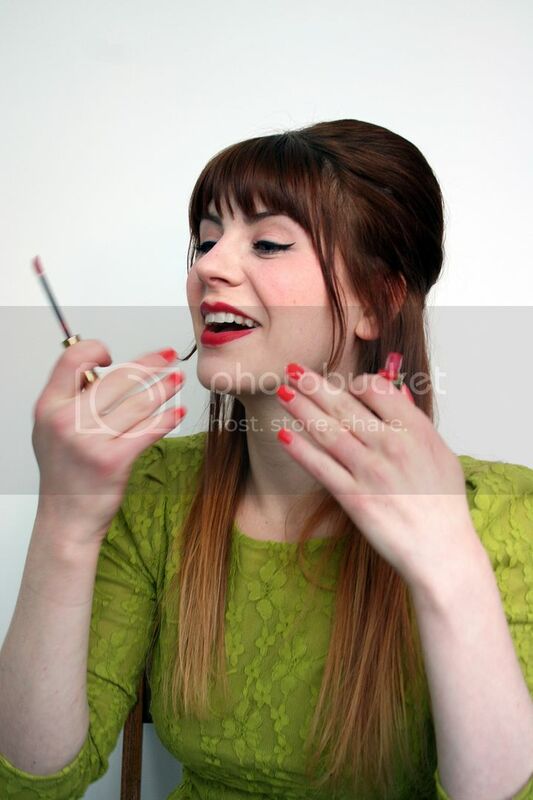 See how Molly layered up to look like a vintage vixen in Life is a Cabaret. 3. A vintage floral pattern makes for a modern 20's look. We just can't get enough of the 20's around here! 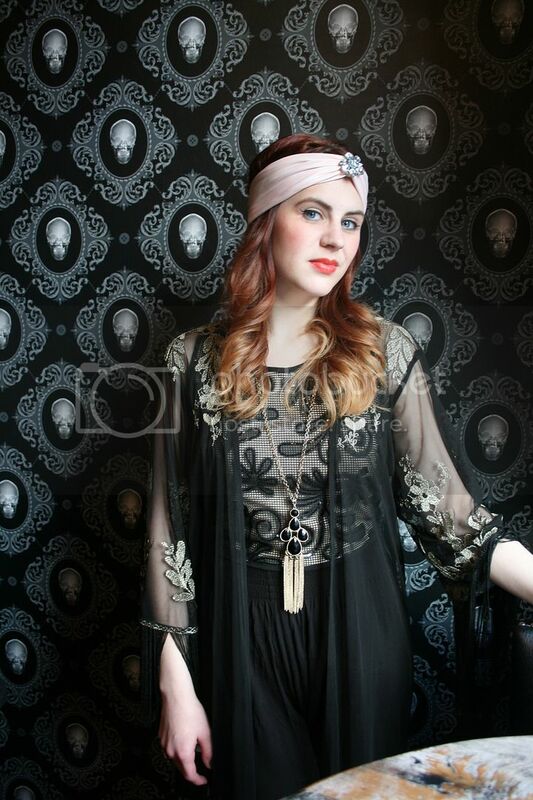 A longer duster style kimono in a vintage floral print is perfect for a modern take on a 1920's look. Pair it with a flowy blouse and a long art deco necklace and you're ready to dance the Charleston! 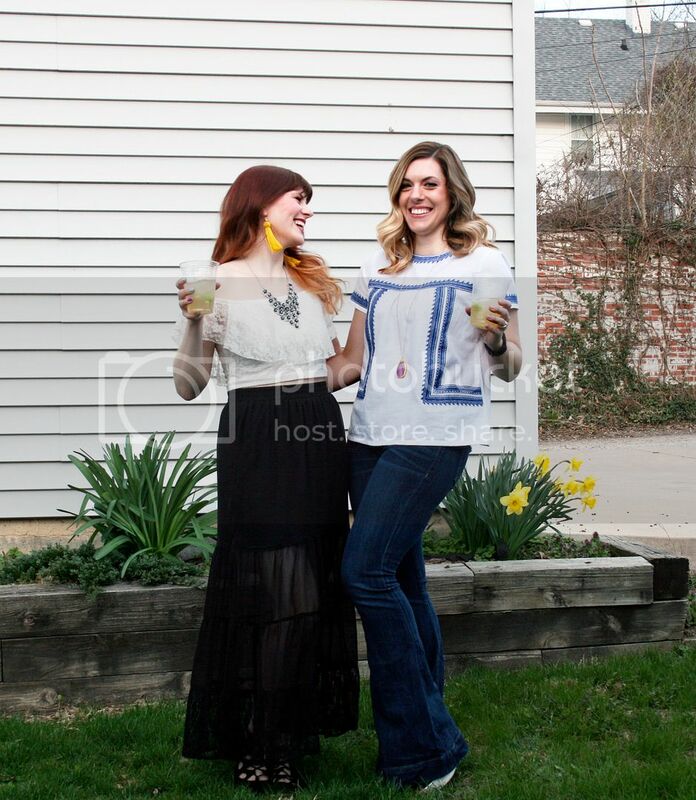 See how Jodi styled her look in The Gin Mill post. 4. Look like a festival-ready flower child. Kimonos, especially long, flowy ones are perfect for hot summer days, because they add drama without adding weight. Plus, they look great billowing in the wind. Molly shows you a way to get this look in her Long Summer Kimono post. 5. Dress up a kimono with a dress. Who says you have to wear a kimono with pants? Kimonos also go perfectly with dresses! Adding a kimono on top of a belted dress takes the whole look to the next level. Add in a couple of bold accessories and you're ready for just about anything! See how Jodi styled this look in Dressed Up Kimono. 6. Add metallics and bold accessories for a night-out. 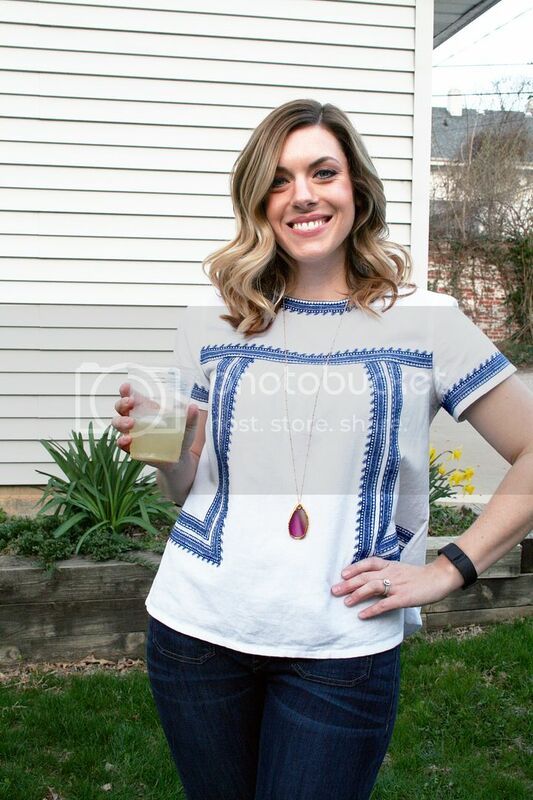 Arguably, most kimonos are great for both day and nighttime looks, because of their statement-making nature, but when paired with metallic prints, long jewelry and fun accessories, like a turban headband, you've got a perfect look for sipping cocktails into the night. 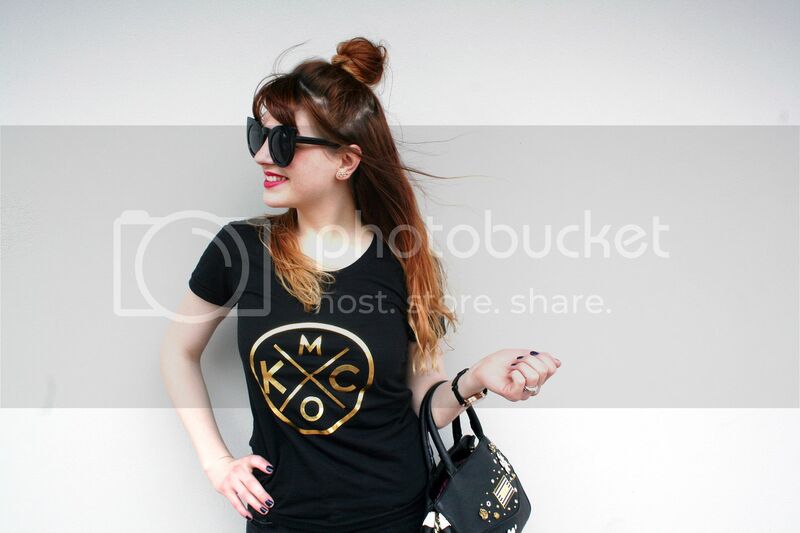 Get outfit details and see how Molly styled her look in the post on The Gin Mill. 7. 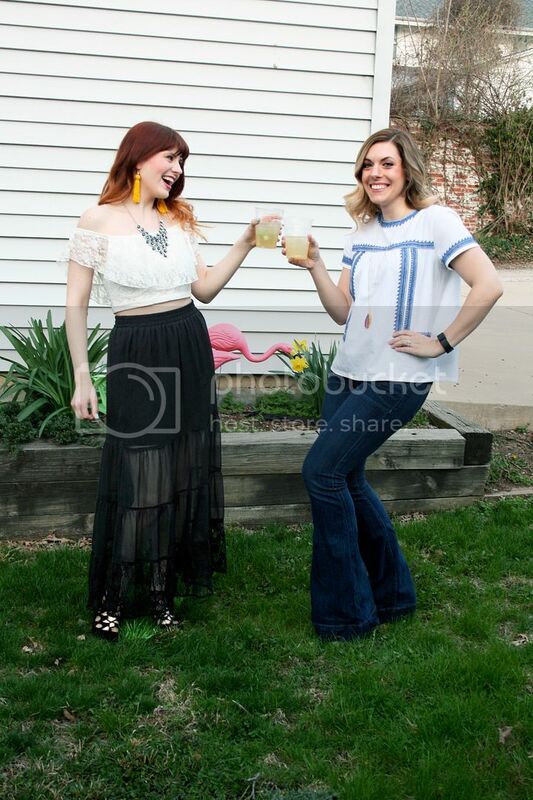 Pair it with bell bottoms for a totally '70s look. 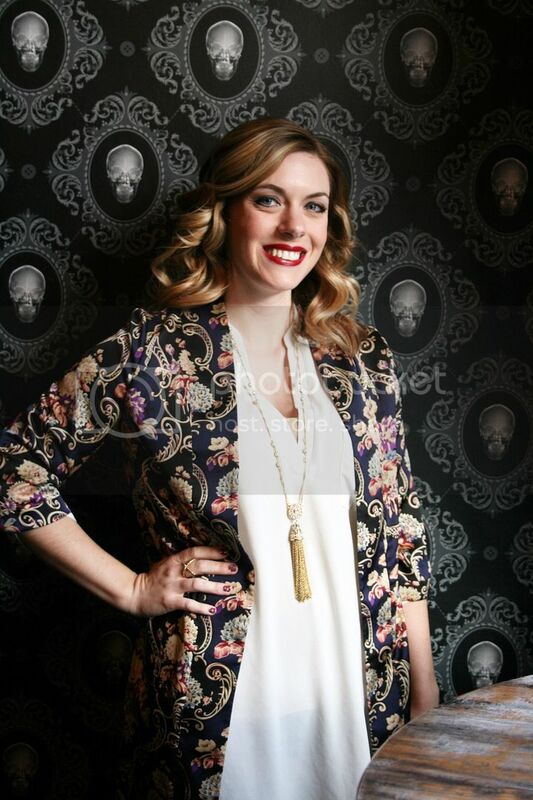 This might be one of Jodi's all time favorite kimono styled looks. Kimonos don't just come in colorful floral patterns. This kimono is a little crochet and metallic number that is perfect for layering over a long white blouse and bell bottom flares. The gold detailing on the sleeve is an extra special touch that makes this look perfect for a night out or a party. 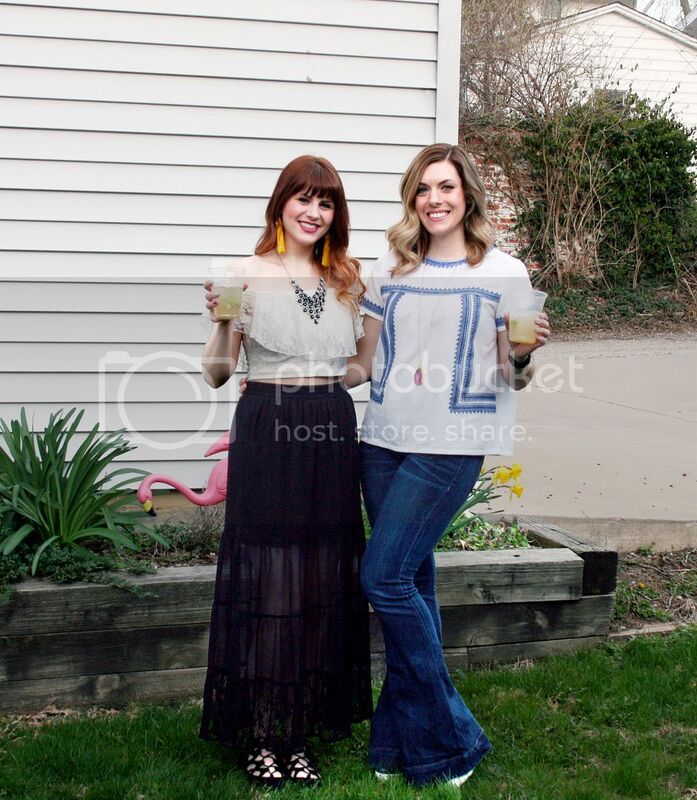 Check out this look in the 70's Shine featuring Chloe + Isabel post. 8. 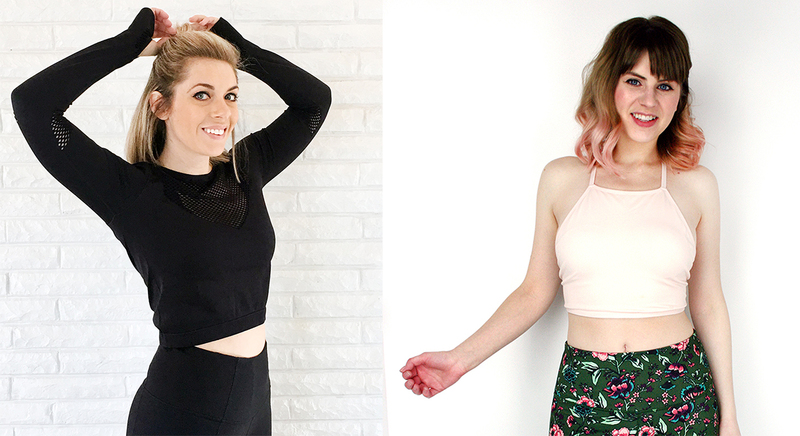 Add pizazz to an all-black ensemble. Bold kimonos are hands-down the best way to take an all-black outfit from bare bones to fun and interesting. 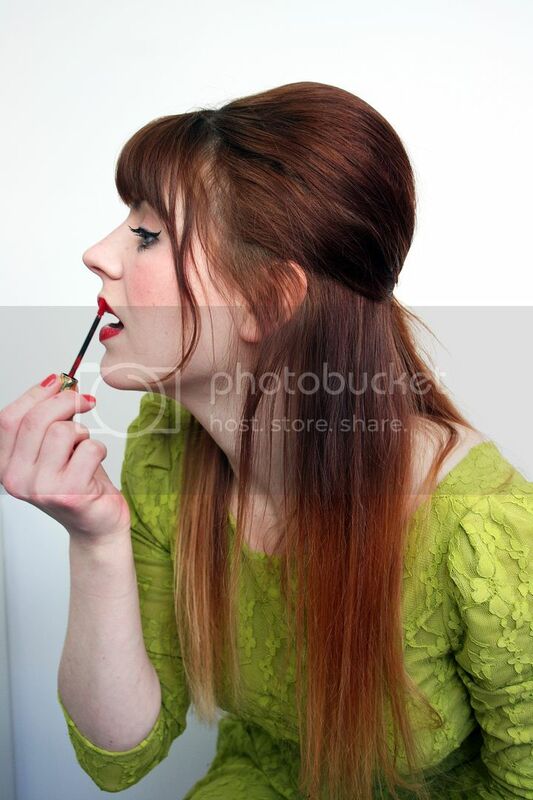 Add a red lip for a fun modern geisha-inspired look. 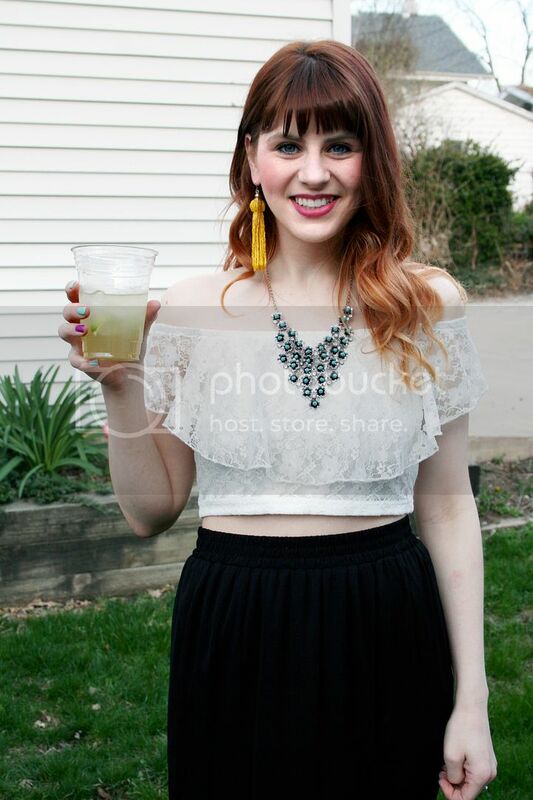 Get all the outfit details in Molly's Fringe Benefits post. 9. Go long and flowy for an artistic chic look. Sometimes you really just want to let it all hang out in a flowy top AND bottom. 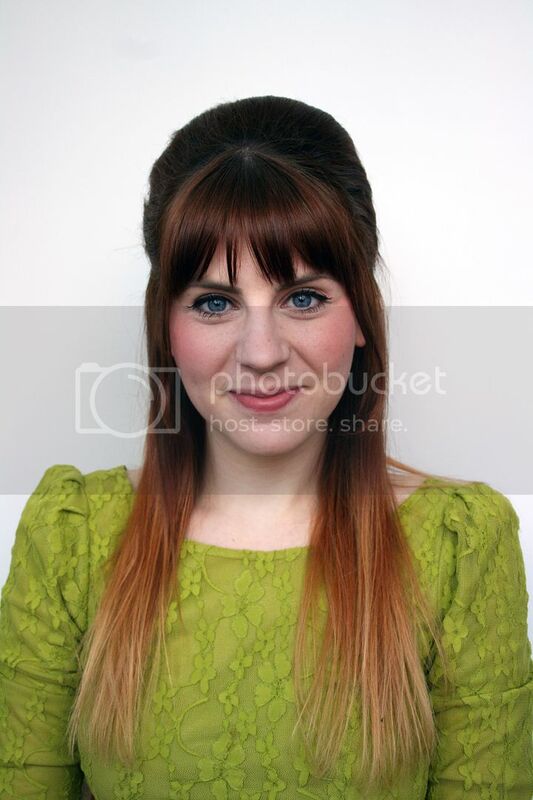 This look is balanced out with a crop top and a sleek braid to keep things in check. Bonus: it's also super comfy. See how Jodi style this look in Flowy Separates. We hope we've given you some inspiration for how to style your own kimonos! 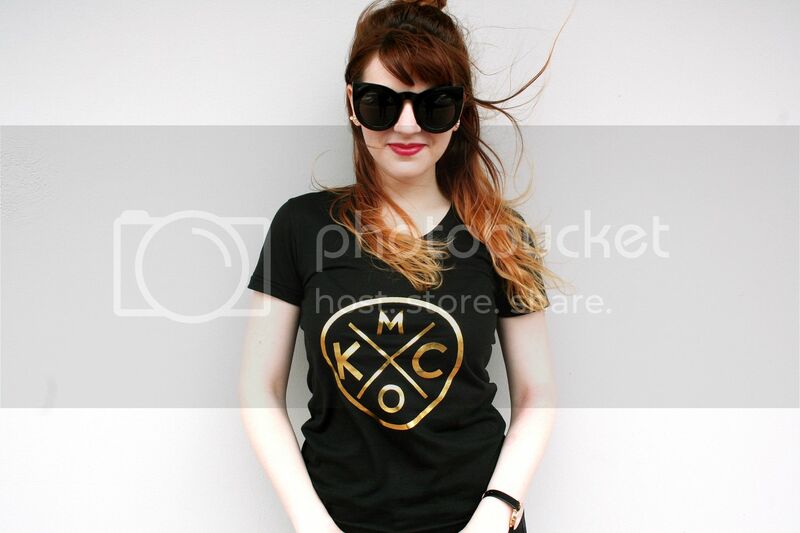 As you can see, they go with an incredibly wide range of hair styles, tops, bottoms, jewelry, and accessories. Basically, the only thing they don't do is make a look boring or simple. What are your favorite ways to style a kimono? We don't know about you, but in the Midwest, April showers are more than just a cute saying. While rain is a great thing, we're mostly just ready for those May flowers at this point. Unfortunately, on rainy days, you can't just snuggle in your PJs and listen to gentle rain falling (and if you do, please let us know how we can get that gig), so we've rounded up a couple of ideas for how to look put-together on dreary days. The most important item for me is footwear that keeps my feet dry. I absolutely love these rain booties complete with cute bows. They're black and off-white, so there's not much they don't match. They're a fun, stylish take on rain boots that aren't big and clunky, and they're honestly one of the most comfortable pairs of shoes I own. I took these on a trip to Scotland and walked all day long sightseeing, and my feet didn't hurt at the end of the day. On rainy days, I really try to avoid tight-fitting clothing, so if it does rain sideways and I get soaked, I don't have any clingy shirt issues. 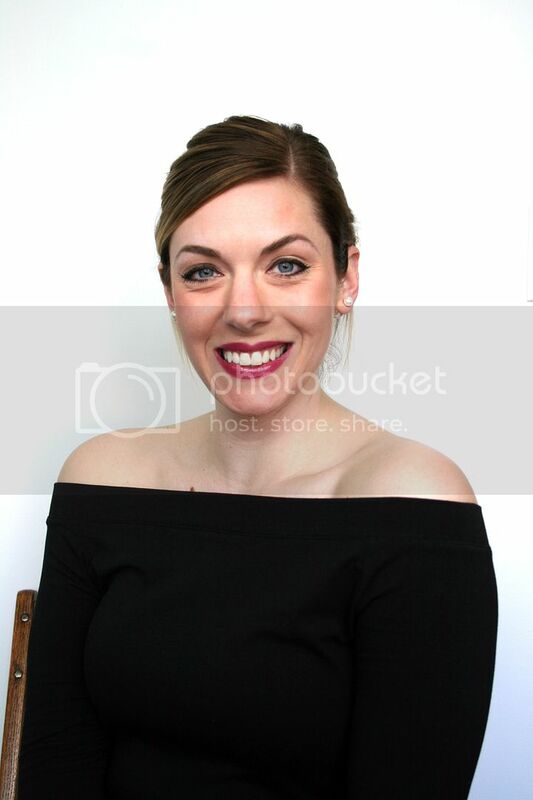 I also try to make sure to wear my hair up, because no matter how I style it down, I will without a doubt look like a drowned rat by the end of the day. A high bun is great, because it's all contained and frizz-free. 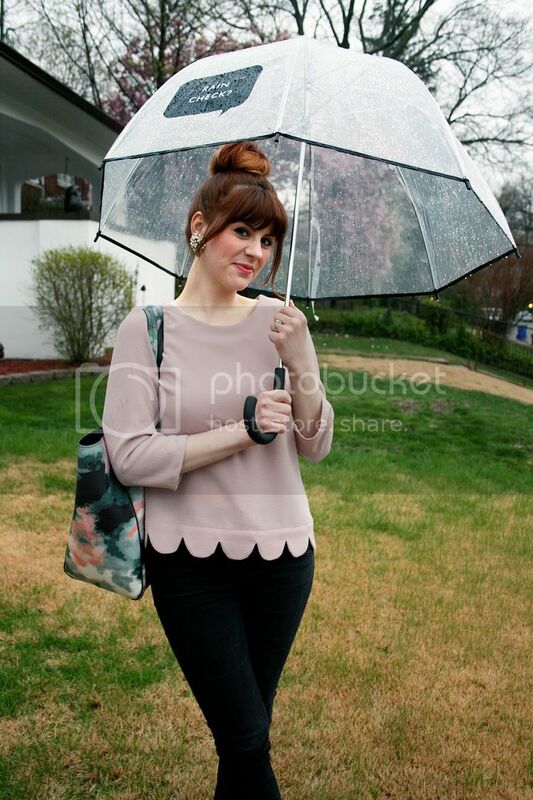 This scalloped lavender top is a great way to keep warm-ish in the cool rain, but still look polished and springy. I love the retro-whimsical quality of scalloped edges, so I went with a baby pink lip and giant white floral vintage earrings to play up the retro vibe. 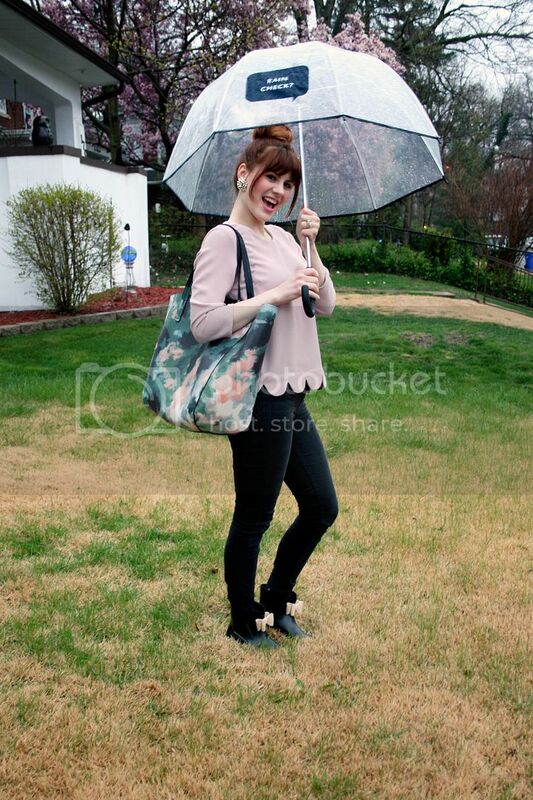 An oversized watercolor print tote seemed fitting for the rain, and will easily keep all my belongings dry. 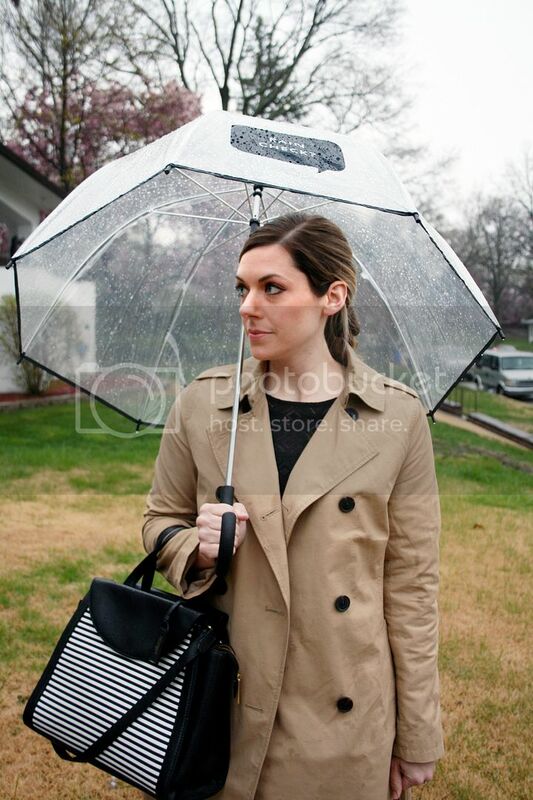 Finally, the most important finishing touch: an umbrella! 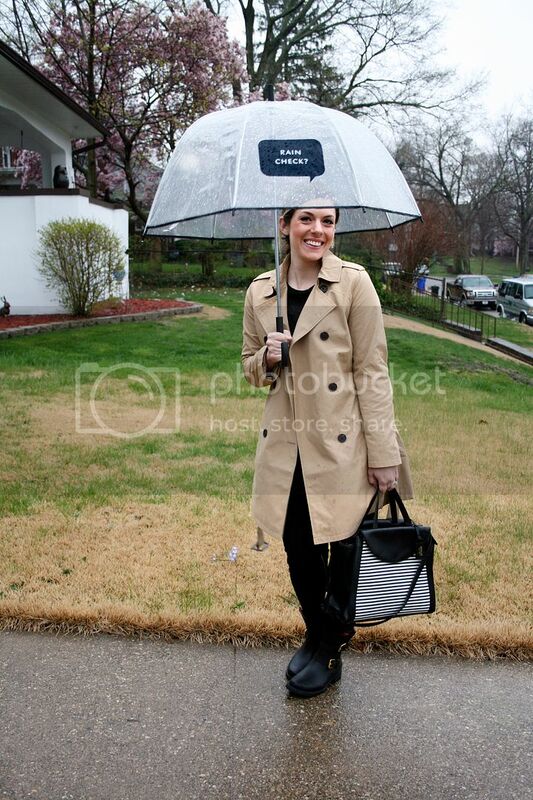 I snagged this Kate Spade umbrella last year, and just love it. 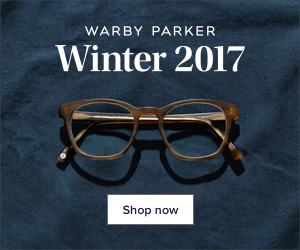 It's clear, so it matches anything you'd be wearing. It's also super curved, rather than more flat on the top, which may not be great for sharing, but keeps more of you dry. 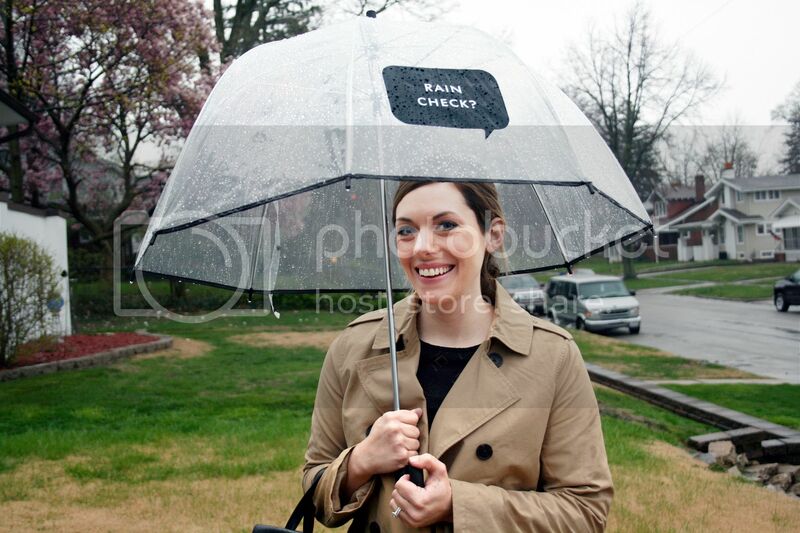 Plus, how cute is that simple "Rain Check" graphic? So, so cute. Dressing for rainy weather can be a real struggle. I don't know about you, but all I want to do on a rainy day is curl up with a blanket and read a good book. 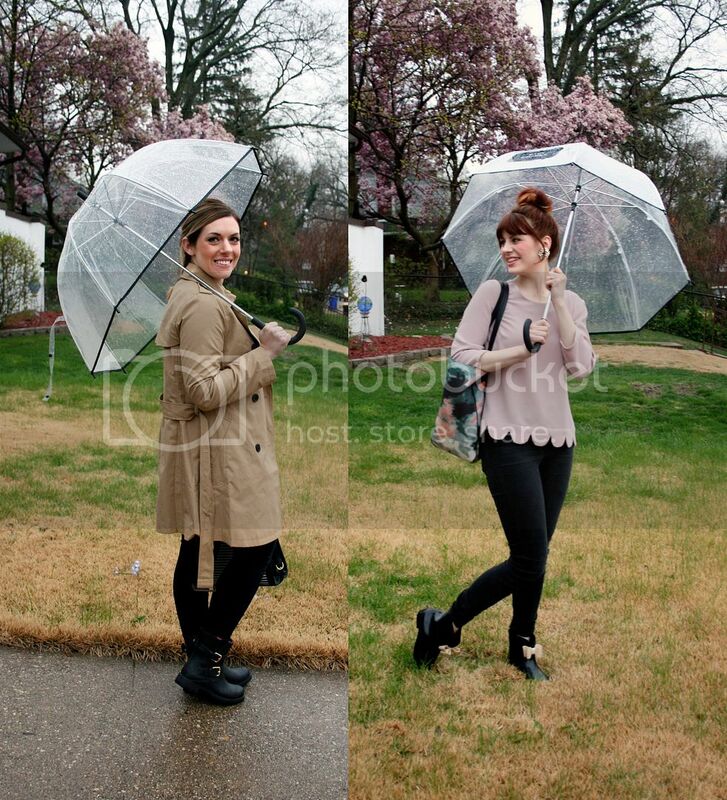 However, most of us have to actually get out in that rainy mess, and why not look good while doing it? I'm a sucker for a good trench coat. My fashion bucket list includes owning a legit Burberry trench, but alas, at the moment I have champagne tastes on a PBR budget, so Old Navy came to my rescue. Don't get me wrong, I love me some Old Navy! We go way back. They are my go to place for cute coats and they did not let me down this year. I even snagged this trench during one of their sales, so I consider that a win! Plus, I can wear it to work and still look professional, even if I am a soggy mess. Since rainy days often put me in a dark mood, I kept the rest of my outfit moody to match. Plus, water stains don't show as well on dark clothing. 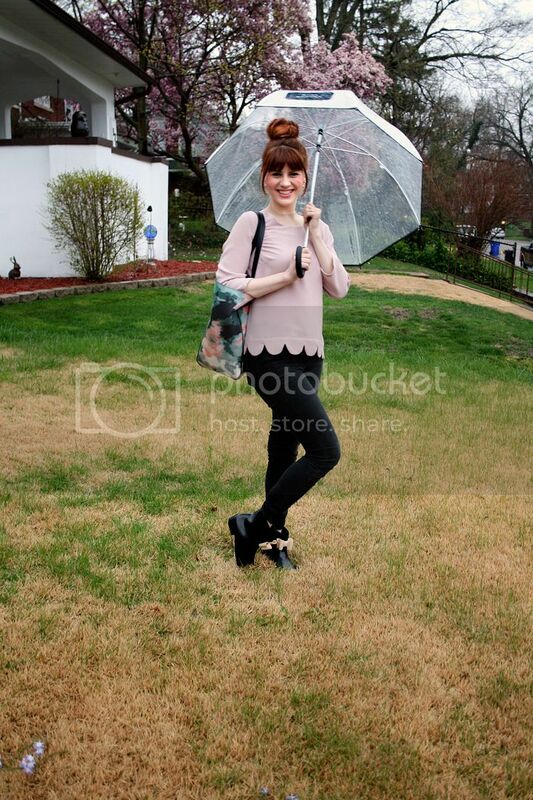 I also borrowed this super cute umbrella from Molly, but I might just need to get one for myself because it is too cute! These Kate Spade biker boots are made of the same material as rain boots, but they also have a little bow on the back and a pink lining. I basically had to have them as soon as I saw them. I've gotten a lot of wear out of them through the winter and now in rainy weather. I definitely consider them to be a closet staple. It almost makes me wish for more rain...almost. We've made a recent discovery that is a total game-changer for us. 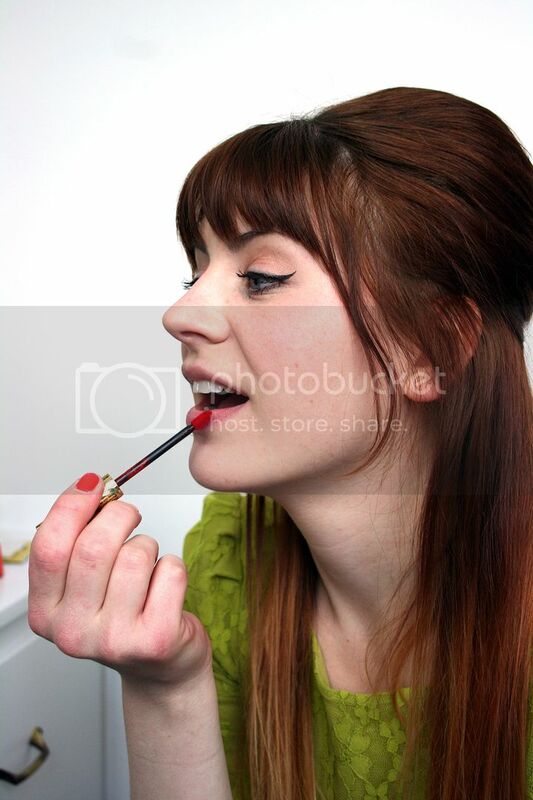 Even with the most expert techniques and tricks (of which we have many), lipstick can end up wearing off and getting cakey later in the day, even if the color stays. 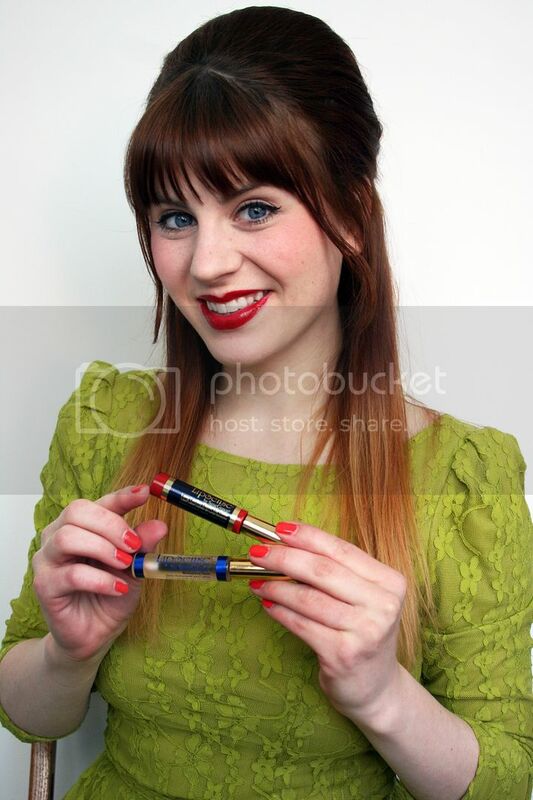 Enter LipsSense from Arkansassy Lips, the lip color that's waterproof, smudge proof and stays in place. Listen, we were every bit as wary as you are going into this, but once we saw how this stuff lasted, we just had to share it with you. 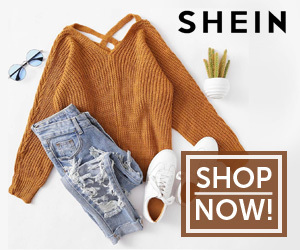 It's awesome because it comes in over 70 colors, and Rylee, our consultant does all the work recommending colors to work with your skintone, level of adventure, or to match a color you currently have at home. You can even mix and match colors to customize! 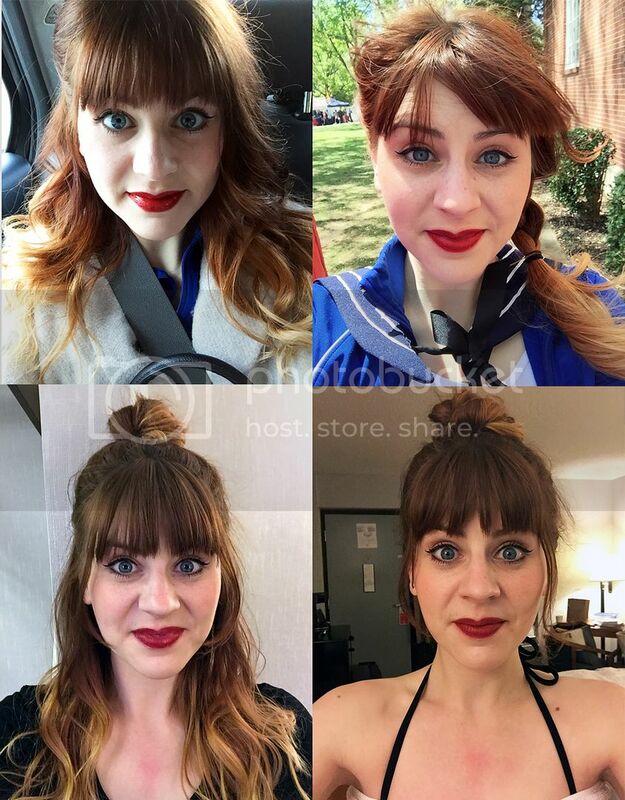 We love that she posts oodles of color choices on real people, usually a good car selfie, because you know this is how it looks on real people! You can also email her directly at arkansassylips (at) gmail (dot) com if you want to bypass the page and get right to buying! 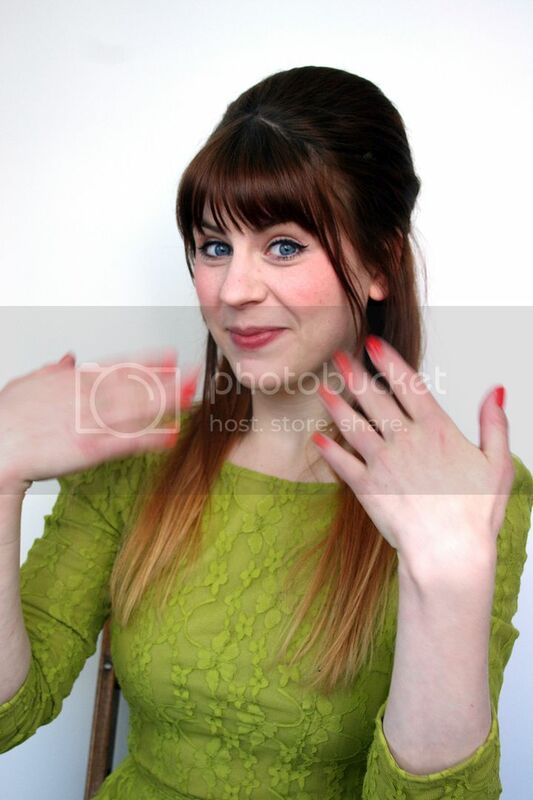 Here, Molly went with Fly Girl red and Jodi went with the popular Lexie Beary hot pink. The most important part of making this system work is the application. Rylee has done some awesome videos and tutorials about how to apply it, but we've also broken it down for you here. Let's get to it! You have to start with a clean base, so clean your lips well with witch hazel. You can find this at any drugstore or grocery store. Next, dry off your lips with a towel or dry washcloth to make sure they're totally dry. Be sure to get inside your waterline, too. Like totally dry. Fan them for good measure. ;) If your lips stick to your teeth, that's a good sign. Essentially you're going to paint the color on first so it stays and then cover with a gloss, so get that color ready! Paint the color on going only one direction, not back and forth, on your lips. This was scary for me since I'm such a lipliner perfectionist. That's why you keep that witch hazel close just in case, but I never actually needed it! For your top lip, you can start at the center bow, just make sure you don't go back and forth over one area, always keep it going one direction, out to either side. You'll do the color coat three times, fanning it dry in between each layer. This only takes a few seconds, don't worry. This also takes the stress off of getting the edges of that lipline perfect the first time, if you've got two chances to kind of correct it. Once you've got those three coats on and dry, you're ready for the gloss! Gloss away, and you're set! 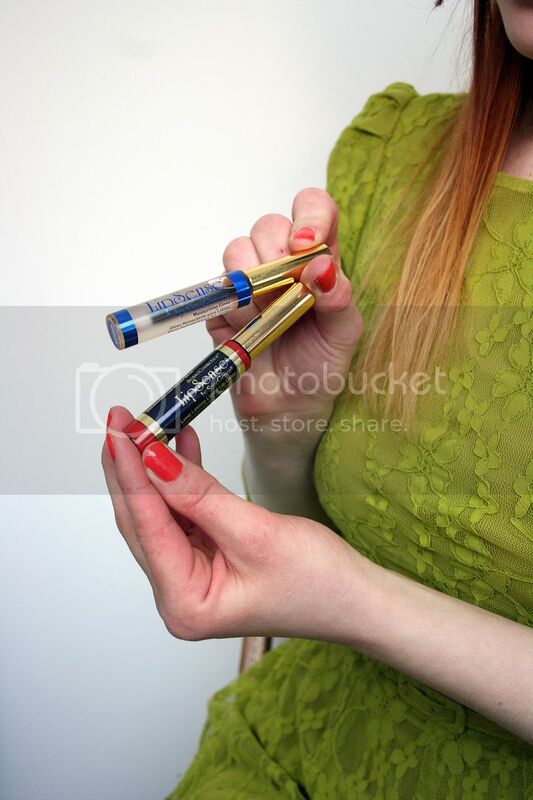 The key now is to gloss throughout the day to keep your lips hydrated. I did this a few times: before and after meals and maybe once or twice more. But, the color underneath doesn't move, so you don't need a mirror or anything, and it takes like 2 seconds to reapply it every time. We've rounded up some of Molly's own ridiculous selfies below to show how this stuff stays on all day. She tested it out for the first time on a dance trip with lots activities, performances, costume changes, and eating scheduled all day, so it was a pretty rigorous test. Top left to bottom right these are: 8 AM, right after applying / 2:15 PM after eating breakfast and lunch (don't mind the dance costume collar there, haha) / 9 PM after dinner and dancing / 10:45 PM after a few glasses of red wine and soaking in a hot tub. 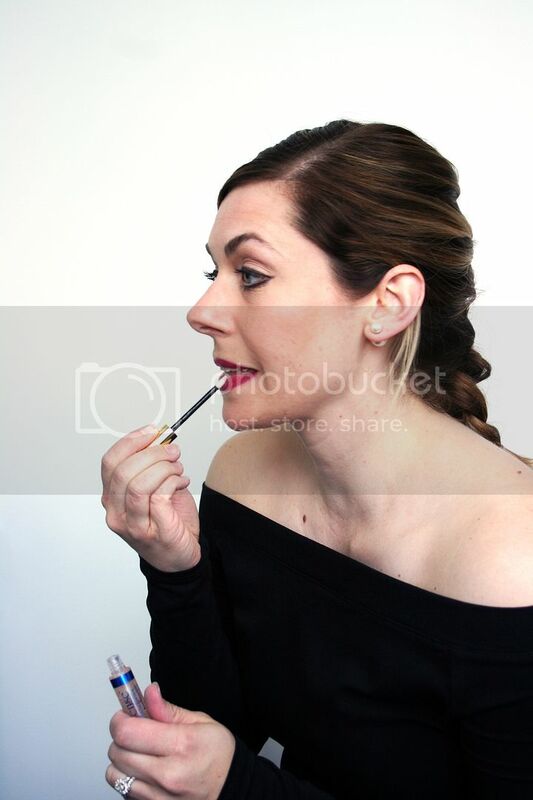 One of the most amazing parts about using this (besides all day lip color you never have to reapply or even look at again) is that you're not leaving lipstick traces like you typically would. Not on napkins, or glasses, or tissues. 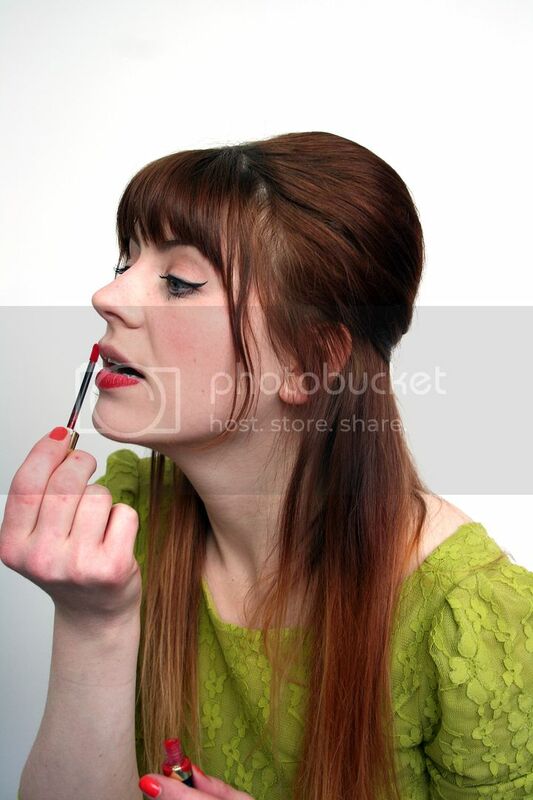 That gloss is the only thing that comes off even if you plant a kiss on someone. 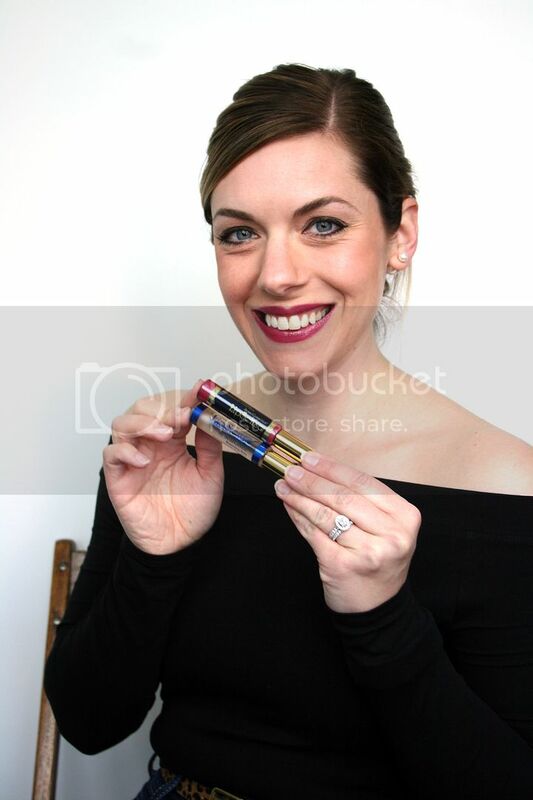 The photos above show Jodi's lip color at the beginning of the day and then at the end, after a full day of wear! That includes breakfast, lunch, the gym, dinner and drinking lots of water throughout the day. 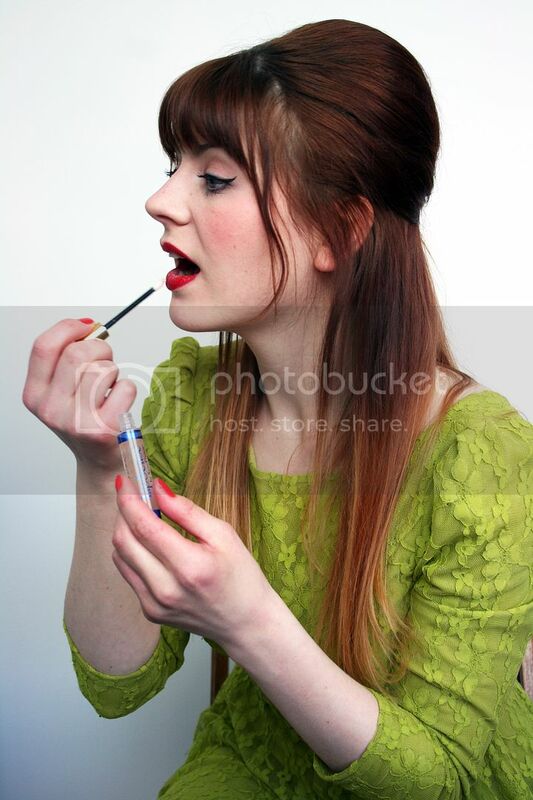 All Jodi had to do was reapply the gloss before our little photo shoot and she was ready to roll! 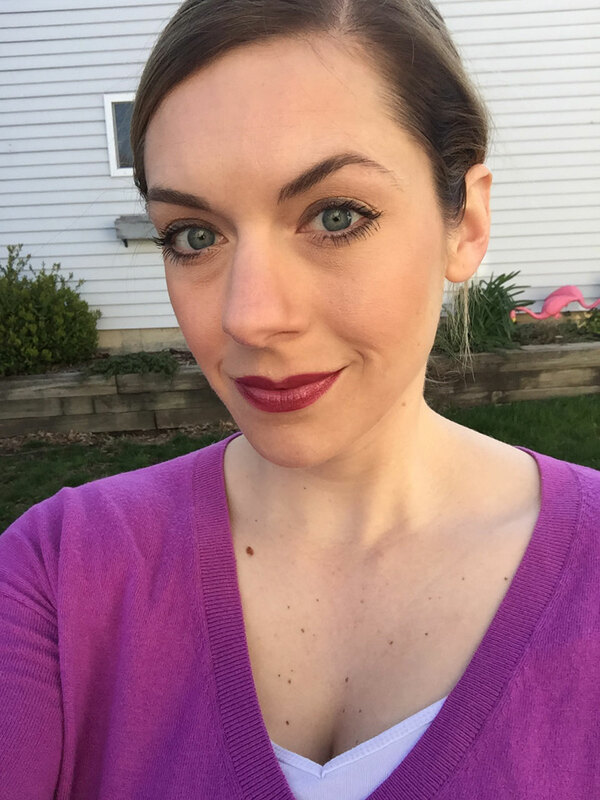 We really hope you will look into Lipsense if you are in the market for a really long lasting lip color. It does take a little time to get the application routine down, but trust us, it's totally worth it in the end. 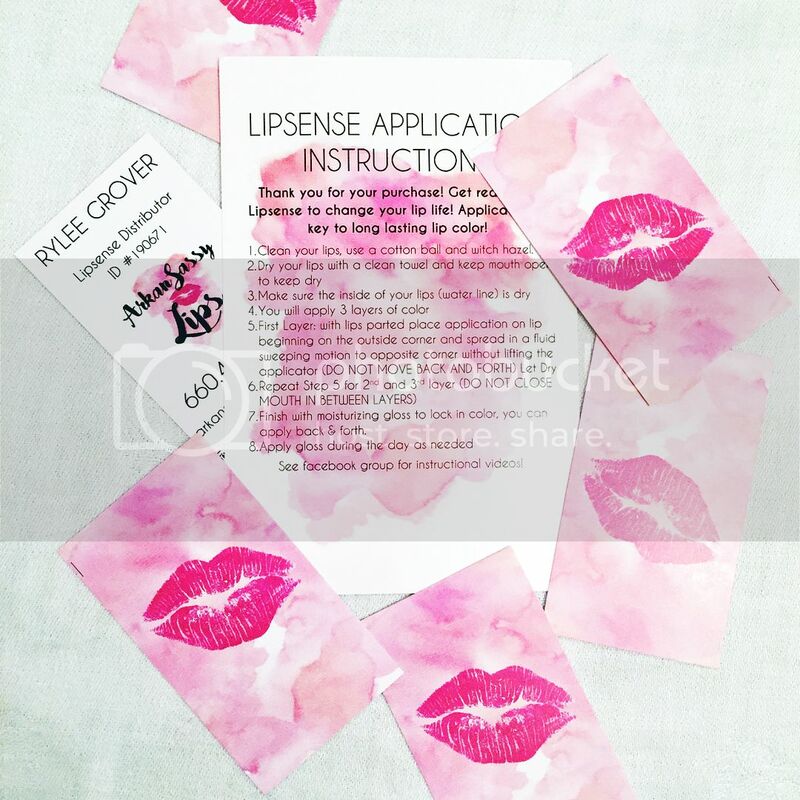 To try it out for yourself, visit Arkansassy Lips (you can simply post ask for color recommendations, and you'll get great customized options), or email Rylee at arkansassylips(at)gmail(dot)com. And let us know what you think!